I got one of the items on my wish list for August... and I adore it. It's beautiful! 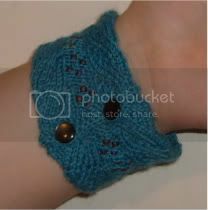 i don't knit well enough to make it myself but I kept going back to the pattern so I made it one of my wishlist items. Isn't it lovely? I put it on before I even read the card that came with it and I didn't want to take it off when I went to bed. Thank you so much Triega!